Cut through the diet confusion. No more guesswork or endless number crunching. We've made it simple for you with these specific 12-week meal plans! Nine separate programs designed to help you live the Venus fat loss lifestyle with no fuss. Venus women know how crucial nutrition is to chasing down lean body and little waist of the ideal Venus body type. But it's easy to get confused by conflicting diet advice and torn between popular protocols. Get right to the nutrition which will work for you with these plans which have been specifically designed to work with the Venus approach. There's no need to look any further. It's all here: exact meal plans, macro and calorie breakdowns, meals and snacks. Now you've visited the Venus Virtual Nutritionist, you know what your start point is. So you can go ahead and get started with our exclusive meal plans. 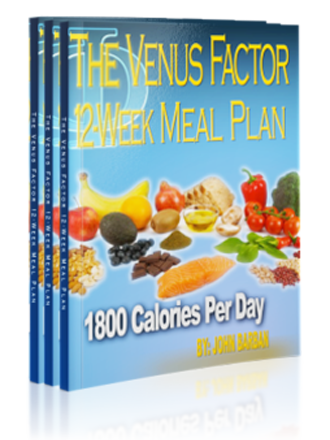 Choose from one of nine separate programs tailored to suit your caloric needs (from 1000 calories per day through 1800 calories per day) then download the Venus meal plan recipe book. You're going to be blown away by these recipes. There's no need to eat cold, bland food out of tubs. Forget everything you think you know about lean eating meal plans. Sure, you'll be losing fat, but you won't be losing your mind. Each meal plan gives you an exact blueprint for 12 weeks of meals and snacks. You'll find calories, protein, fat and carbohydrate breakdowns for every meal and every day. We'll talk you through how to use carb cycling, refers and higher carb days to keep the fat loss coming. The 12 week meal plan recipe download features 20 simple breakfast recipes, 54 easy lunch or dinner recipes and 3 awesome snack recipes each with precise macro breakdowns. All you need to do is find the meal plan which suits your caloric needs, hit download and get instant access to the easiest fat loss diet you've ever seen. Your energy levels and motivation will stay high whilst you lose body fat! Notice: grocery lists are included in individual meal plan PDF.